Recently, we sat down with Michael Yolen, our very own QA Manager, and discussed everything that has to do with transcription. Michael started his career as a medical transcriptionist. Since he wanted to travel, the idea of a totally portable career seemed like an excellent choice to him. He then moved on to being a proofer (editor) doing pre-delivery Quality Assurance (QA), and finally, into Quality Assurance and coaching. Coaching fit well with his background in teaching and his commitment to helping others. 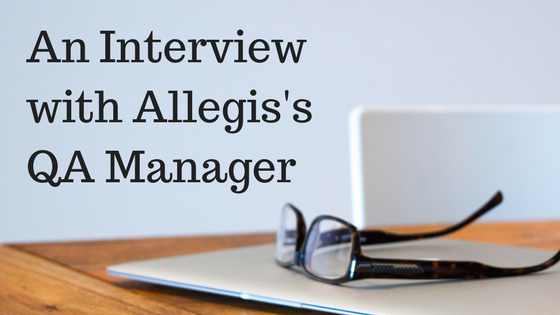 Currently, in his role at Allegis, he oversees our Quality Development Program. His position involves managing our Quality Development coaches and QA Specialists. Essentially, he oversees the progress of all our incoming transcriptionists as well as the overall quality of transcription at Allegis. In the following interview, Michael looks back on his 16 years in the industry and shares what makes a great transcriptionist, how to acquire crucial skills, the areas in which transcriptionists often struggle, and what to expect when getting started as an Independent Contractor (IC) at Allegis. Q: In your opinion, what makes a great transcriptionist in terms of traits, attitudes, and aptitudes? That’s an interesting question, and it’s something that I spend a lot of time thinking about. It would be great if we could actually pinpoint an exact set of requirements that guarantees someone will do well. You get people applying who have all different kinds of backgrounds. On paper, when I just look at a resume, for example, I might think this person would be perfect, and then they really struggle. Or somebody else may have no experience whatsoever, and they’re fantastic. Transcription is really difficult. It’s not unskilled; being a fast, accurate typist is a necessary skill, but it’s not sufficient—by itself, it’s not going to mean someone will make a good transcriptionist at all. You also need good grammar and research skills, and you need to be comfortable using resources, have computer skills, know how to get around in Word, how to use auto-correct or text expanders, or at least be willing to learn these things. You must enjoy learning. You need good time management and organizational skills. You need a good, quiet place to work! I would say on top of all of this, which is your base of the pyramid, the people who succeed are the ones who really want to do it. They’re not people who just need it to make an extra $100 a week. Those people, really, are not successful because it’s not a simple or easy job. There is a learning curve, and transcriptionists need to commit to it to do well. Q: You’ve talked about several important skills that someone new to transcription should have. Is it possible to acquire those skills along the way, or do I just need to show up, day one, having all that knowledge? It’s not so much knowledge as a skill set. You wouldn’t have to have any information about auto-corrects or text expanders, for example, because we could point you in the right direction there, and that’s just helping you with production. But the rest of it you kind of need right off the bat. Those are skills you could have acquired by just being the kind of person who likes to research things on his or her own time, such as reading news articles, books about history or grammar, or even mystery novels. You may be one of those people who have these skills without ever having transcribed. You can be a total beginner and either have a good ear for accents or enjoy watching TV shows with people from other countries—anything like that would really be helpful. If you live in a little town somewhere, let’s say, in the middle of the country, and only see people and listen to people from that town, it’s going to be more difficult for you. I’ve actually seen that happen. You may not have ever heard anybody speak with a Pakistani accent, let’s say. You can learn it, but you’d have to want to put in that extra time, and it can become a stumbling block. Q: In what areas do you see transcriptionists struggle? The main struggle is getting new transcriptionists up to production speed. First, they want to make sure they have all of their skills down, they know how to do research, they know what their company’s formatting standards are, and then they have to try and get faster to make money. It seems that people who, when they are released from coaching, if they really concentrate right away and put the time in, their production goes right up. However, some people just fizzle out. It may have to do with how many hours they commit to, but the people who are going to be successful seem to be the ones who manage to put the time in and get their production up fairly quickly. They want to make money, which means they need to get their production up, and then that will make them happy and successful. The longer it takes them, I think the more frustrated they become. Q: For someone who’s going to do well, how quickly do you see them get up to production speed? You can actually do it in a couple of weeks. I certainly think that as a personal goal, if you were starting this job, you would give yourself, say, two weeks to make your minimum pages. Otherwise, the longer you give yourself, the more frustrated you’re going to get. How much more than the minimum you do depends on how much money you want to make, so start by setting specific weekly goals for yourself right away. Q: What can an Independent Contractor expect when going through Allegis’s Quality Development Program? The coaching stage runs for about two weeks. We have a pretty flexible coaching program, but the beginners tend to take the whole two weeks. Everyone gets their own coach, who will meet with and encourage them, and the coach will also be the person who assesses their work through assigned files. As an IC, you will meet at least twice with your coach, but probably more than that depending on what you need. There’s a lot of back-and-forth in terms of the coach talking to you and seeing that maybe you’re brand new to this kind of transcription, but you’ve done some other types of transcription. Maybe you’re more confident and can work more quickly, or maybe you’re less confident and need more coaching. It really depends on the person. We try to tailor it as much as possible to the individual. You certainly would have your coach available by phone or email. We use Zoom for video conferencing and for sharing screens to go over feedback together. After you pass a minimum number of files, you are released to work on our regular queue. To recap, after two weeks you become a part of the regular workforce, and then, after two additional weeks—and this is true for both beginning and experienced transcriptionists—you would get a regular QA assessment just to touch base and see how you’re doing. Most people do fine on this, and then everyone gets a QA assessment every quarter. Q: Any other tips you have for someone considering a career in transcription? I can only think of two things. One is to really brush up on your MS Word skills. Make sure that you’re good at using that program. The other tip is to go online and work with practice audios. You have many great options available to you online. I think even Express Scribe has some on their site. Try it out and see if you like it. You can even listen to interviews on YouTube and try to transcribe those just to get a sense of what transcribing is like. I always secretly wanted to be a private investigator so transcription suits me well. I also wanted to be an Edior, so verbatim transcription can be challenging. I agree about getting through the learning curve. I was half-hearted at first but once I sat down and created text expanders and set a goal to create new ones each week, my production soared. Some days it’s too boring for words but other days it’s like a story you can’t wait to finish! I love my job. This is a very thorough description of a transcriptionist. I struggled at first, had no training, but had some very harsh (graders). All we got were grades. No discussion at all. So I hate to see confidence pushed under the rug. I think the 2-week coaching is incredible, especially in building confidence. The other skills are necessary, but coaches, build their confidence. They will succeed sooner and it will be much easier in the long run, if they believe in themselves. Bravo! Very good interview! I’m a retired nurse and medical transcriptionist of 20 yrs, so I’m an old hand, but I’m a novice at MS Word, so I suppose I should get Word and learn it before I tackle the new arena of insurance transcription! This is a very helpful article and will use it to guide me in the important points to address first! Thank you Tyler.